This unconventional and unique whiskey barrel wedding band is perfect for anyone who wants a more natural, down-to-Earth look. This ring is made of a comfort-fit scratch resistant tungsten carbide to complement a reclaimed wood inlay cut from a genuine Jack Daniels whiskey barrel. It features unique patterns and distress marks that only come from aged casks. The barrel inlay is sealed to prevent water damage. 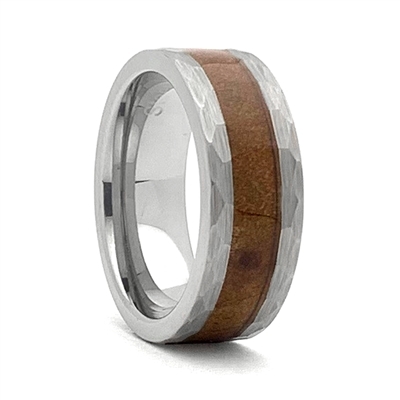 Hammered look edges coupled with wood ensures this ring is trully a bold statement. Say “I do” with this exquisite Tennessee whiskey barrel ring on your special day. Tungsten Carbide wedding rings cannot be resized. To make sure you order correct size, please refer to the Ring Sizing Guide ant the bottom of the page in the Quick Links section. Our Tungsten Carbide/ High-Tech Ceramic rings come with a Lifetime Warranty, so you can enjoy your ring everyday as much as on the day you purchased it. For more information on Lifetime Warranty, please refer to the Quick Link section at the bottom of the page.